Using the right file format for the right job makes workflows more efficient for engineers and business users alike. Advanced analytics on big data requires the right formats for performant queries. Converting your data to a big data file format like Avro or Parquet can save both time and money. With Nexla, format conversion doesn’t have to add more work to the queue. Nexla can take any structured data format and convert it to Parquet or Avro for machine learning or advanced analytics. Optimizing the file format for your use case is the right thing to do, and with Nexla, format conversion is easy. Data is oxygen for analytics, but companies can choke on the cost of processing data. Consider a leading media company that needed to analyze their AWS CloudTrail logs with Looker. 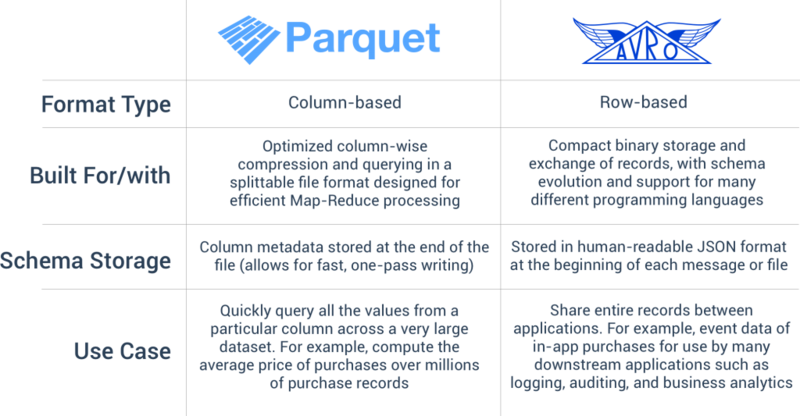 To keep querying costs at a minimum, BI analysts needed their logs in Parquet format. By using Nexla, analysts could convert data to Parquet to run queries in Athena with Looker, without the help of a data engineer. Query speeds increased by at least 25x and costs decreased by 40%.